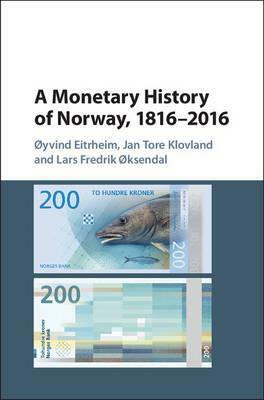 This book provides a broad overview of monetary developments in Norway over the past 200 years, using a rich variety of graphical illustrations based on a unique data set of historical monetary statistics, which will be documented and made available on the Norges Bank website (in English) at http://www.norges-bank.no/en. Throughout the book, Norway's monetary developments are anchored in a historical context and in the development of monetary thinking. Through their analysis of the historical data, the authors provide new insights and comparisons to other Scandinavian countries, along with an excellent examination of the development and character of the banking and financial system in Norway. Preface; 1. A monetary history in five parts; Part I. The Long Promise, 1814-50: 2. The Dano-Norwegian monetary system before 1816; 3. The thorny road to resumption, 1816-48; Part II. The Rise of Private Deposit Taking Banks, 1850-1914: 4. Newfound stability in times of crisis, 1848-70; 5. Volatility and stability in the time of gold, 1870-92; 6. Stability in times of crisis and growth, 1892-1914; Part III. World War I and Turbulent Interwar Years, 1914-40: 7. The wartime money glut, 1914-20; 8. Bank crises and resumption of pre-war gold parity, 1920-8; 9. The early escape from the golden fetters, 1928-40; Part IV. Money in Times of War, Central Planning and Regulation, 1940-86: 10. Extreme liquidity creation during the occupation years 1940-5; 11. Money in a new world, 1945-55; 12. The era of corporative policy and regulation, 1955-71; 13. From regulation to markets, 1971-86; Part V. The Long Return, 1986-2016: 14. A decade of crises and reforms, 1986-98; 15. Inflation targeting - overcoming the fear of floating, 1998-2016; 16. The future of money seen from the past; Bibliography; Index. 'Norway's rich monetary history spans everything from monetary union with other Scandinavian countries in the nineteenth century to the gold standard, financial repression, managed floating, and now inflation targeting. Not only aficionados of Norway but also readers interested in comparative monetary regimes will find much that is new, interesting, and illuminating in this important and impeccably documented book.' Barry Eichengreen, University of California, Berkeley 'Congratulations to the Norges Bank on its 200th birthday. Its best present is this excellent history of its long and eventful life, in five parts, a worthy sibling to the earlier tomes on Norwegian historical monetary statistics. This is a feast for all those who enjoy monetary history. The authors have an excellent understanding of the historical problems and processes facing Central Banks in general, and the Norges Bank in particular.' Charles Goodhart, London School of Economics and Political Science 'This book is a most welcome addition to the growing and important literature on monetary history. The authors, with a mix of expertise in economics, history and statistics, reveal fluently the very varied course of Norwegian monetary history across two centuries. They add hugely to our understanding of Norwegian experience and by extension to our understanding of monetary history more generally.' Professor Forrest Capie, Emeritus Professor, Cass Business School, City University London 'Capitalizing on impressive new quantitative evidence, the authors give us the monetary history of Norway, set against the backdrop of the economic and political developments that brought a small peripheral economy to be one of the richest counties in the world. This book is a standard reference for anyone interested in the history and economy of Scandinavia and Europe.' Gianni Toniolo, Libera Universita Internazionale degli Studi Sociali Guido Carli (LUISS), Center for Economic and Policy Research (CEPR), and Duke University, North Carolina "Norway's rich monetary history spans everything from monetary union with other Scandinavian countries in the nineteenth century to the gold standard, financial repression, managed floating, and now inflation targeting. Not only aficionados of Norway but also readers interested in comparative monetary regimes will find much that is new, interesting, and illuminating in this important and impeccably documented book." Barry Eichengreen, University of California, Berkeley "Congratulations to the Norges Bank on its 200th birthday. Its best present is this excellent history of its long and eventful life, in five parts, a worthy sibling to the earlier tomes on Norwegian historical monetary statistics. This is a feast for all those who enjoy monetary history. The authors have an excellent understanding of the historical problems and processes facing Central Banks in general, and the Norges Bank in particular." Charles Goodhart, London School of Economics and Political Science "This book is a most welcome addition to the growing and important literature on monetary history. The authors, with a mix of expertise in economics, history and statistics, reveal fluently the very varied course of Norwegian monetary history across two centuries. They add hugely to our understanding of Norwegian experience and by extension to our understanding of monetary history more generally." Professor Forrest Capie, Emeritus Professor, Cass Business School, City University London "Capitalizing on impressive new quantitative evidence, the authors give us the monetary history of Norway, set against the backdrop of the economic and political developments that brought a small peripheral economy to be one of the richest counties in the world. This book is a standard reference for anyone interested in the history and economy of Scandinavia and Europe." Oyvind Eitrheim is a director at General Secretariat, Norges Bank. He served as Director of the Research Department at Norges Bank from 2001 to 2009 and is currently coordinating projects related to Norges Bank's Bicentenary Project 1816-2016. Selected publications include The Econometrics of Macroeconomic Modeling (2005, with G. Bardsen, E. S. Jansen and R. Nymoen), Twenty Years of Inflation Targeting: Lessons Learned and Future Prospects (2010, co-edited with D. Cobham, S. Gerlach and J. F. Qvigstad), and Central Banks at a Crossroads: What Can We Learn from History? (2016, co-edited with M. D. Bordo, M. Flandreau and J. F. Qvigstad). Jan Tore Klovland is a professor of economics at the Norwegian School of Economics in Bergen, Norway. He has published journal articles on macroeconomic history, price history and monetary history as well as on the development of ocean freight rates. Selected publications include 'Pitfalls in the Estimation of the Yield on British Consols' (Journal of Economic History, 1994), 'Monetary Policy and Business Cycles in the Interwar Years: The Scandinavian Experience' (European Review of Economic History, 1998), and 'New Evidence on the Fluctuations in Ocean Freight Rates in the 1850s' (Explorations in Economic History, 2009). Lars Fredrik Oksendal is a former senior advisor at Norges Bank and is currently writing a study of the Technical Assessment Committee for the wage bargaining process in Norway commissioned by the Ministry of Labour and Social Affairs. He is a history graduate from the Norwegian University of Science and Technology (2001) and holds a doctorate in economic history from the Norwegian School of Economics (2008). Oksendal has published extensively on financial and monetary history and is a co-editor of The Gold Standard Peripheries: Monetary Policy, Adjustment and Flexibility in a Global Setting (2012, with Anders Ogren).